Add-On Unit Is Designed To Expand Lorell Industrial Wire Shelving Starter Kits (Sold Separately) And Organize Your Storage Areas. Kit Includes Four Shelves And Two Posts. Easy Collar-And-Sleeve Assembly Requires No Tools. 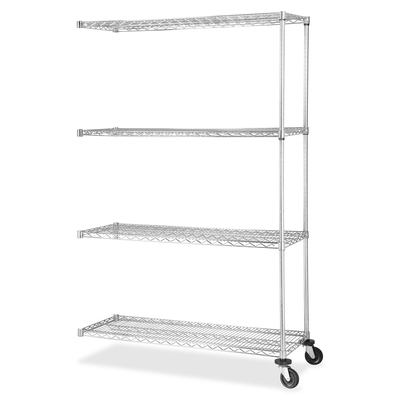 Each Shelf Supports Up To 1,000 Lb. Evenly Distributed And Adjusts In 1" Increments. Shelving Is Made Of Steel With A Chrome Powder-Coat Finish, 10-Gauge Shelf Surface, 3-Gauge Frame, And 6-Gauge Wave Pattern..